As I curled up in bed last night with my bare feet warm against the soft fuzz of the flannelette sheets, I smiled in one of those totally content, life is really good kind of ways. 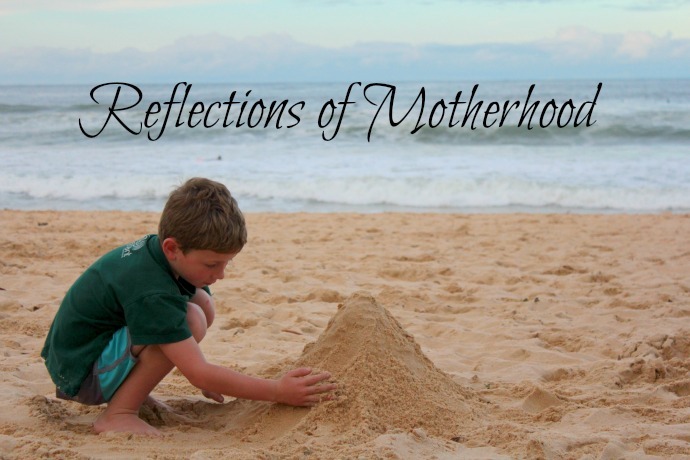 And with another Mother's Day coming to an end I took a moment to reflect on what Motherhood means to me. Behind closed eyes I pictured my life, my mothering journey as a music video clip. What I saw was like a collage of memories of my Mothering journey to date. It wasn't one of those completely sappy dubbed to tearful music kind of show reels that played out in my mind. Instead it was more of an eclectic alternative compilation, a marriage of varying styles and tones, because to me that is EXACTLY what being a mum is like. An explosion of sounds and tempo with soaring high notes evened out by a head splitting thump of low low low tones. There were the tears of utter disappointment at yet another single line on a little plastic pee stick. And sad lonely days as I grieved for a dream that I felt the universe was denying me of. Then, that breathtaking all consuming awe as I felt that first flutter, the first kick and then finally that moment I held that precious precious new life in my arms. There are those moments of pure heart exploding overwhelming gooey love where you look at your child or children and you cannot believe your good fortune. That child, those children, they are ours. What could I possibly have done to deserve such joy? There are the times when your stomach churns with worry, your body aching with their pain and you feel like you are consumed with fears for their well being, state of mind and future. You sit in Doctors surgeries and hospitals, smiling to hide your concern from them and yet you feel like on the inside your fear is burning like acid through your veins and tragically for some, Motherhood brings with it grief and emotion that no human should ever have to endure. There are days when you would beg to be committed to somewhere, anywhere. You just want to be anywhere as far away as possible from the noise, the chaos and the craziness that has become your life. There are moments when you want THEM committed somewhere, anywhere that they cannot pinch each other, punch each other, or breathe ALL of each others air! There are the feelings of utter pride as you watch them achieve big momentous occasions like awards and trophies. But more importantly the quieter achievements where you bear witness to acts of kindness towards siblings, friends, animals and strangers. There are whole nights you spend crying, because you are worried that they are lonely at school or struggling with navigating the friendship minefield. You stress about their speech, their hearing, their growth, their weight and whether they are getting enough veggies and sleep. And then there are the nights you spend replaying precious moments like births and birthdays and other key milestones. You desperately try to etch them deep into your mind so that they are never at risk of fading or God forbid being forgotten. There are the quiet moments where you just sit and hold them. You breathe in their sweet smell, soak up their warmth and feel every little molecular being of that hug. There are times you get angry and so frustrated to the point you want to kick that damn laundry basket / lego set / homework bag from here to kingdom come. You stare at them as they talk back at you, shout at you, snarl at you and question whether you have completely ballsed up this Motherhood gig. There are the hilarious stomach hurting from too much laughing, nose snotting, mascara running funny moments where you find yourself gasping for air at the hilarity of toilet humour and mispronounced words. And all the while in the back of your mind aware that these kids are growing up too quickly, so quickly you can almost see them growing older as you sit there and laugh with them. Amid all the triumphs of first steps and first words, are the humiliating public meltdowns and dummy spits and then the fist pumping pride as you watch them make new friends and venture outside of their comfort zone, you get a sense of just how lucky you are that you are experiencing this, and pure joy and gratitude that you are a part of something so wonderfully bigger than you. Most importantly last night I reflected upon how fortunate I am to be blessed with this incredible gift of being someones mum. You need the low thumping baselines to even out the high notes. You need the melody to intertwine with the story and you need the varying pitch of the soulful voices to bring it all together. Motherhood doesn't fit into any one genre, it is as individual and unique as we are as mums. I hope everyone found some level of joy in this Mothers Day just gone, whether it be through sharing the day with your children, your babes in bellies or your own Mums. Or whether it was relishing in the dreams of your future as a mother or quietly sorting through the memories you once made with your own mum. Did you wear your macaroni necklace proudly?